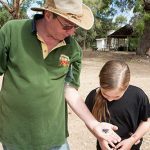 Have you every thought about Sapphire fossicking? 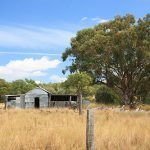 Gourmet Getaways is on a bit of a country adventure at the moment. We’re doing some exploring out west! Given that it’s NSW School Holidays we decided to take the opportunity to visit Dubbo Zoo. While en route we’re checking out what the bush has to offer in the way of family fun. 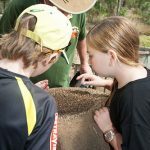 An absolute highlight of our westerly adventure has been Sapphire fossicking at Inverell NSW. From the moment I saw the brochure I knew this was something we had to try! 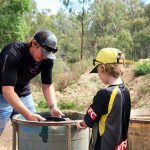 I had no idea if Sapphire fossicking would actually yield gems, but I thought it would be a fabulous experience for the family. With all the technology kids use today I thought it would be good for them to experience a messy hands on holiday activity. I figured it would also give them an understanding of some of Australia’s geological and prospecting history. 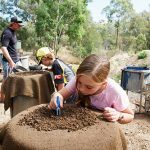 7 Oaks sapphire fossicking is located just 20 km outside of Inverell on the Frazer Creek. We simply followed Swanbrook Road out of Inverell until we reached Rickeys Lane. The 7 Oaks fossicking site is very well signposted. When we arrived at the address there was a sign that said we should follow the dirt road as they were already fossicking. I love the laid back way of country Australia. With the camper van in tow, we followed the dirt track 2 kilometres or more until we reached the fossicking site. We were greeted by Dave. Brett asked him where we should park. In true welcoming spirit we were told that right where we were looked fine. I noticed two couples down by the shed sifting dirt intently and washing the sieves in water. There was also another young family that were hard at work going through the sludge. We asked Dave what our chances were of finding a Sapphire. He pulled a plastic bag out of his pocket and poured some sapphires onto his hand. We were all stunned, we asked if he had found them here. He must have thought we were a little slow to pick up on things but we really didn’t expect to find gems. Dave told us these are the stones he has found in the last day or two. We were all surprised at the apparent prevalence of Sapphires on the site. Wow, Anais had found a Sapphire and we hadn’t even started! Once again she had found a Sapphire and we hadn’t started. Dave walked us through the process of fossicking. 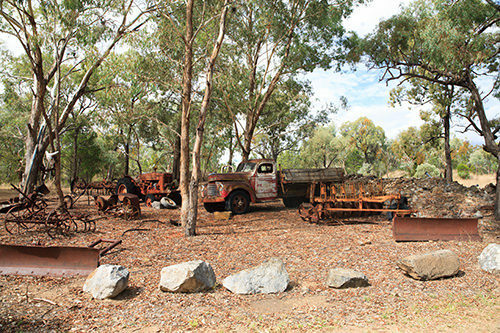 He took us over to a big pile of dirt and explained that the owner used machinery to dig this out of the creek below. The fossickers are given a shovel and a bucket to fill from the dirt pile (called a wash). This is what they call virgin wash as it has come straight from the creek without any screening. 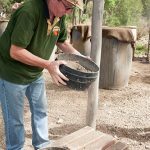 Once the bucket is full we were shown how to tip the dirt into a two sieve system. Loose dirt was shaken through the sieve. 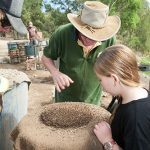 The top sieve is removed to reveal the big rocks. A quick peruse of the larger rocks was undertaken, they were washed, checked and then thrown over the end into the trailings. The more interesting sieve was always the bottom sieve where the smaller stones were located. These too were washed to remove any remaining dirt. Once cleaned, the sieve would be tipped out onto an old flour sack. This was the moment of anticipation! It was explained that the sapphires would usually be located at the top of the stones, in the middle of the circle, as they were the heaviest mineral. We were told that it also pays to have a good look through the stones as this doesn’t always happen. 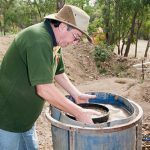 Dave demonstrated the steps with a sieve of stones from the pile. We all watched as he turned the sieve onto a hessian bag. Sure enough, right in the centre of the stones was a beautiful blue sapphire. It was impossible to miss. It was our turn to give it a go. Sure enough another Sapphire! I was shocked at our luck! We were all immediately hooked. The kids were like little machines running backwards and forwards to the dirt pile and the water buckets. Not every sieve held a sapphire but there were enough being pulled out to keep it exciting. I had heard that diamonds are found in this area too. I asked if any had been found on the property. Dave told a story about a couple who kept 6 stones they thought may be diamonds to have checked. It is difficult to tell the difference between Zirconium, Quartz and Diamonds so they need to be appraised. All six were later confirmed as diamonds. With that thought in mind, I kept a closer eye on all the colours of the rocks. Sure enough I found a suspicious looking white stone. At the moment I don’t know if it’s a diamond or a pretty rock but I’ve kept it just in case. Our biggest sapphire find of the day actually rolled off the dirt pile toward me as Brett was digging. It has lovely blue and yellow hues through the stone. Again, it was such a shock to have a gemstone land at my feet, but we’re told this is also common! I spoke to some of the other fossickers and they proudly showed me their treasures. One couple told me they had intended to stay for just a day of sapphire fossicking and now, four days later they were still fossicking. They said each would say, “Just one more day and we will head off…” but when the next day came they were hooked and wanted to stay for just a few more bucket loads of dirt. I can absolutely understand how they feel Sapphire fossicking is addictive! It has been a definite highlight of our trip for every member of the family! The facilities at 7 Oaks are actually quite good for a bush camping experience. The area is absolutely beautiful and each campsite is quite private. 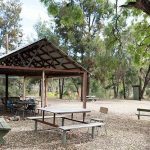 The campsites are all separated by natural uncleared bush or foliage. They also have toilets a communal gas BBQ available and picnic tables which are located under a shelter. I imagine the gas hot water shower gets quite a workout at the end of a hard day fossicking. Allow more time than you think because you will love it! I have to admit I was a little envious of the groups that were still fossicking when we left. 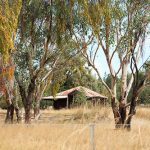 If I had realised there was bush camping available on site I absolutely would have planned to stay a night or two. Unfortunately our itinerary was set, and we were on a time limit. Bush camping $15 per night, fossiking $50 per family per day. Half day fossicking $25. Best of all you keep what you find. When we get home I would like to have two of our sapphires set into a piece of matching jewellery for Anais and myself. Tell me readers, have you ever been Sapphire Fossicking? How did you go with your prospecting?